I had been under the understanding that Chicago Animal Care and Control Return to Owner actually meant “stray” return to owner. Little did not I know it included other categories which CACC considered return to owner. 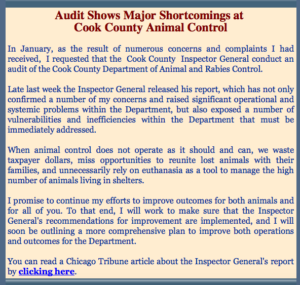 This is my statement to the Commission members of Chicago Animal Care and Control on July 19th. 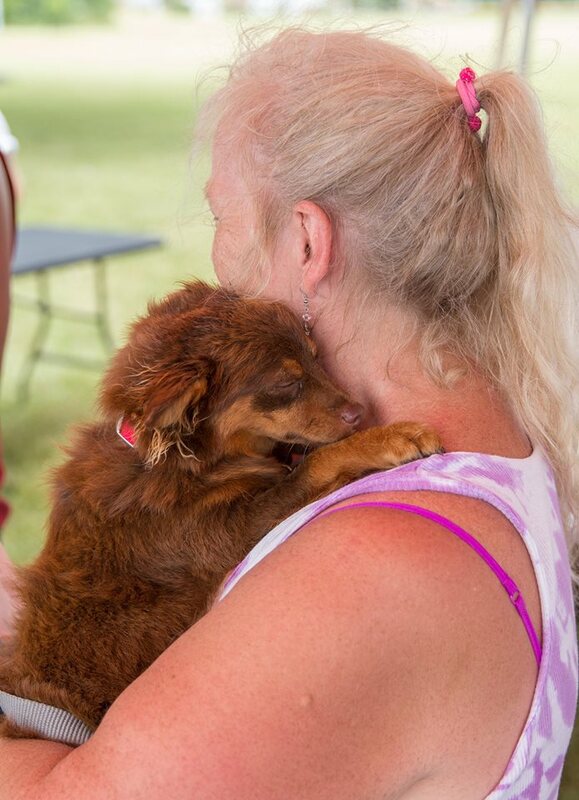 My name is Susan Taney, Director of Lost Dogs Illinois. Lost Dogs Illinois is a not for profit organization that helps citizens find their lost dogs and Good Samaritans find lost dog’s owners but we also work with Animal Controls to increase their Return to Owner rate and decrease their stray intake.. We have typically defined Return to Owner as the percentage of stray or lost dogs who are brought in to CACC which are reunited with their owners. I would first like to address the return to owner statistics. I’ll refer to it as RTO from here on in. 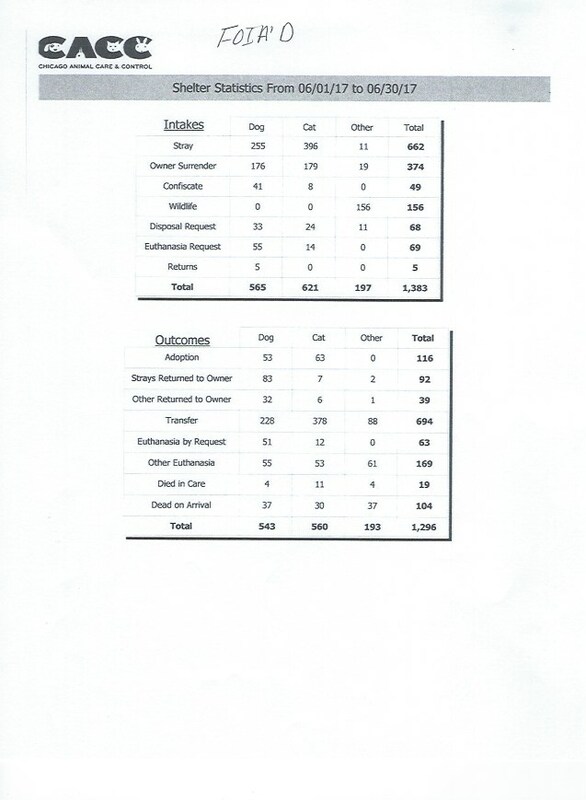 This year on CACC’s website I noticed that in the month of March the RTO statistics were split into categories: strays that were reunited with their owner and other dogs that were returned to their owner for other reasons. 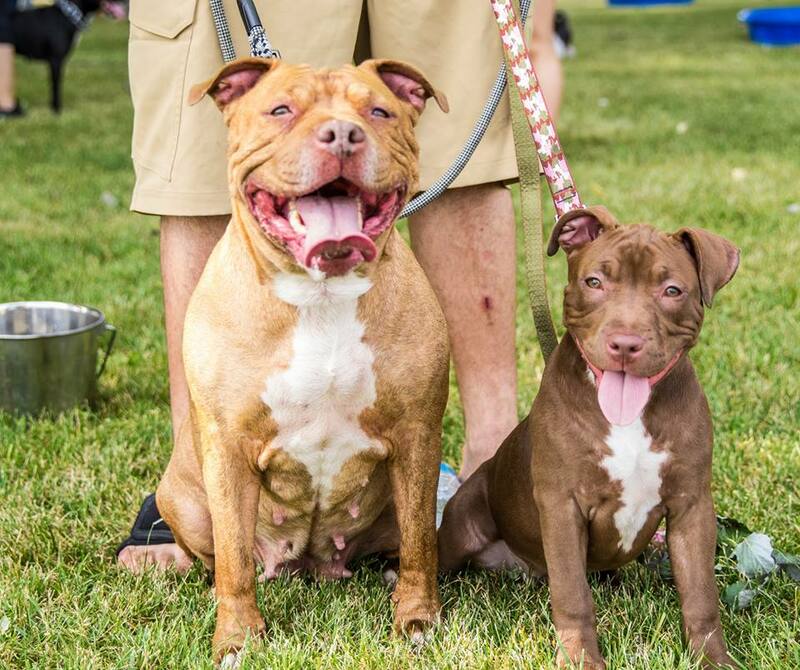 (to give you examples: dogs surrendered and the owner changed their mind or evictions or owner went to hospital so these were “return to owner” ). In all the discussions we had with CACC we assumed we were on the save wavelength and only referring to the strays that were reunited with their owners. Also, I noticed that there was a whole new description about the live release rate and other definitions in regards to statistics. 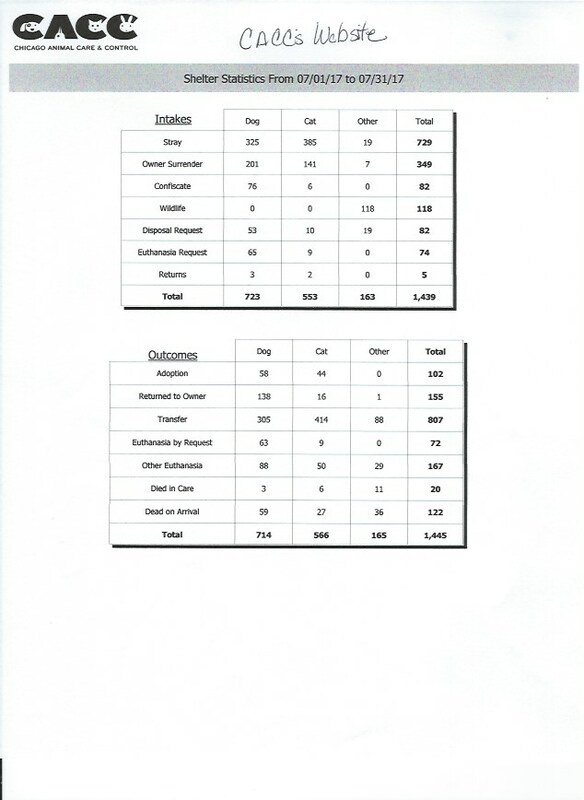 With that in mind, the RTO statistics that I have reported to both CACC and the public have been wrong and are not as positive as I thought they were. 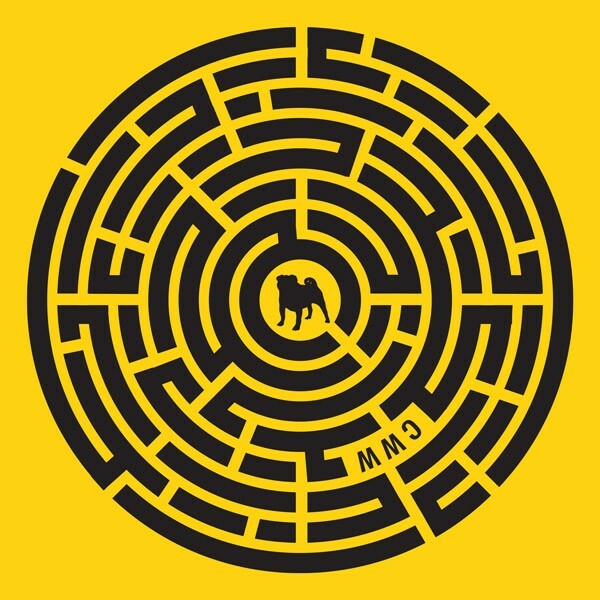 Never was there any indication with discussions with any of the directors and staff that RTO included not only strays but the other categories I mentioned earlier, as well. So I am going to now tell you the actual number of stray dogs reunited with their owners for three months in 2017 compared with what I wrote about on our website and Facebook page in which I gave praise to CACC for their stellar improvement. I am very disappointed and disheartened about this discovery in regards to the statistics. Stray intake has been consistently been at 60%. Progressive animal controls are taking a hard look at stray intake on how to decrease it. At the last commission meeting I attended, I made suggestions. 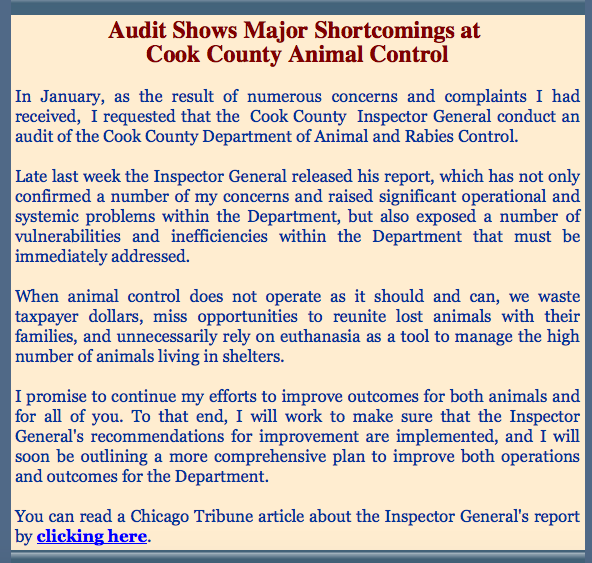 I don’t know who the new Director will be but I am truly hoping the new Director will try to fix the broken animal control system in Chicago with being a leader in the field which will expand to Cook County.Obviously the Live Release Rate has increased but the actual animal control system needs to be addressed, supported by the mayor and public and brought into the 21stcentury. 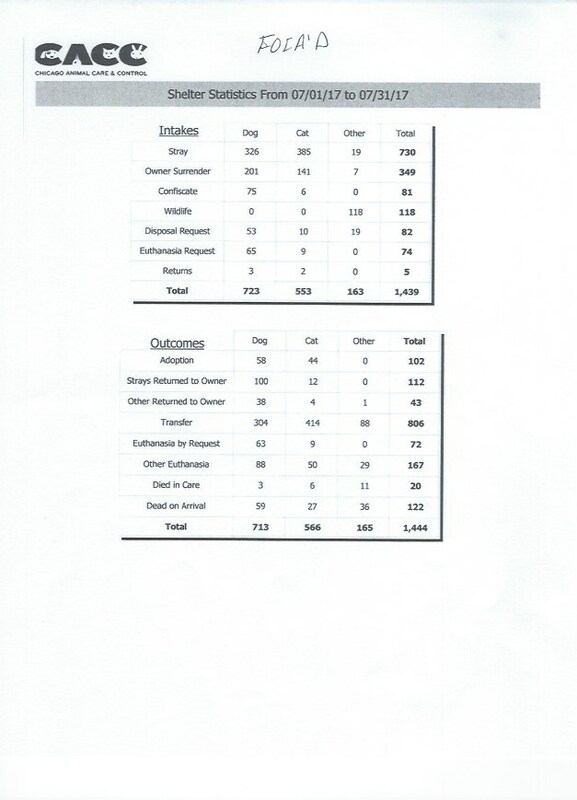 Below listed are the actual statistic posted on the CACC’s website. 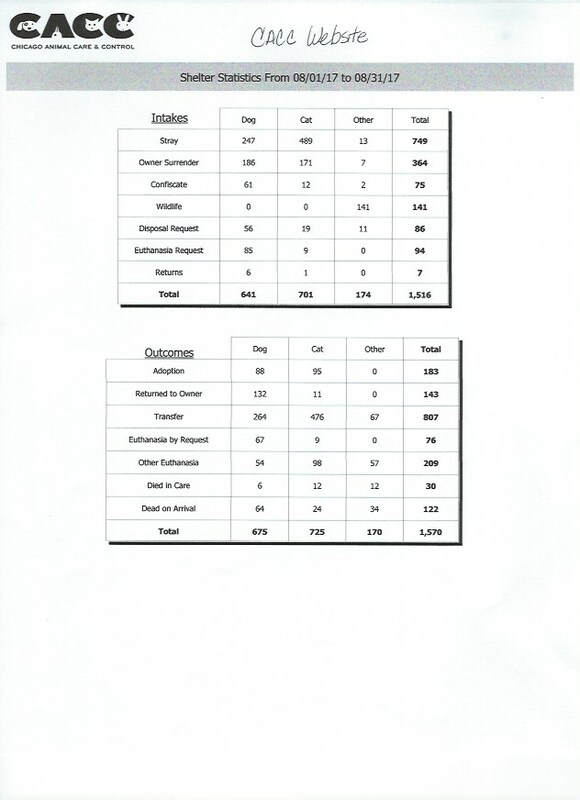 Below are the actual statistics that I FOIA’d. What is FOIA? The Freedom of Information Act (FOIA) is a United States federal law that grants the public access to information possessed by government agencies. Upon written request, U.S. government agencies are required to release information unless it falls under one of nine exemptions listed in the Act. As a citizen you have the right to request information possessed by government agencies. 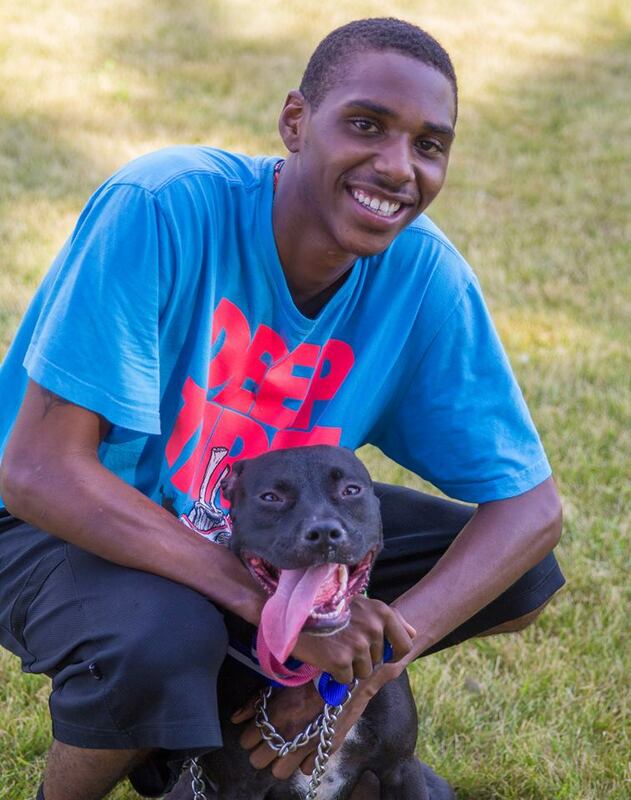 This entry was posted in Animal Control/Stray holding facilities, Rescues and Shelters, Statistics and tagged CACC, City of Chicago Animal Care and Control, Lost Dogs Illinois, return to owner on July 30, 2018 by Lost Dogs Illinois. This week I, personally and professionally, learned a valuable lesson, never ever underestimate the survival instinct of a dog. I, because of this underestimating, did not do everything in my power to find a dog until a full day had almost passed which could have contributed to this dog losing her life. All because I underestimated a 5 pound chihuahua dragging a leash. This past weekend, Memorial day weekend I was sent a text message by another ACO from our neighboring AC about a tiny little chi who was lost in a forest preserve that was next to my territory. The family had been out at a party enjoyin the Memorial Day holiday and had their dog on leash. A bigger dog, not on leash, ran at this little dog, Blanca. Blanca in fear took off and the owner lost control of the leash. 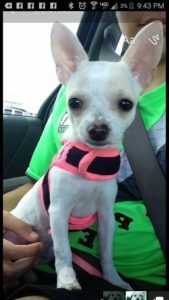 So the last the family saw of their little girl was her running through a parking lot in the forest preserve dragging her pink leash. They looked and didn’t see her again that day. I found all this out about ten oclock that night. It was too late for me to get in the forest preserve (they lock the gates at the entrance). The rangers gave me permission to enter the park but without my vehicle because of the gate. Where they had seen Blanca was over a 1/2 mile inside the park and it was now pitch black. I would have never seen her if she was running around. In addition this forest preserve is large, has at least five different shelters, a running path and I didn’t have any idea even where I would look. The whole night I was upset that I couldn’t help figuring this little one had no chance to survive the night. 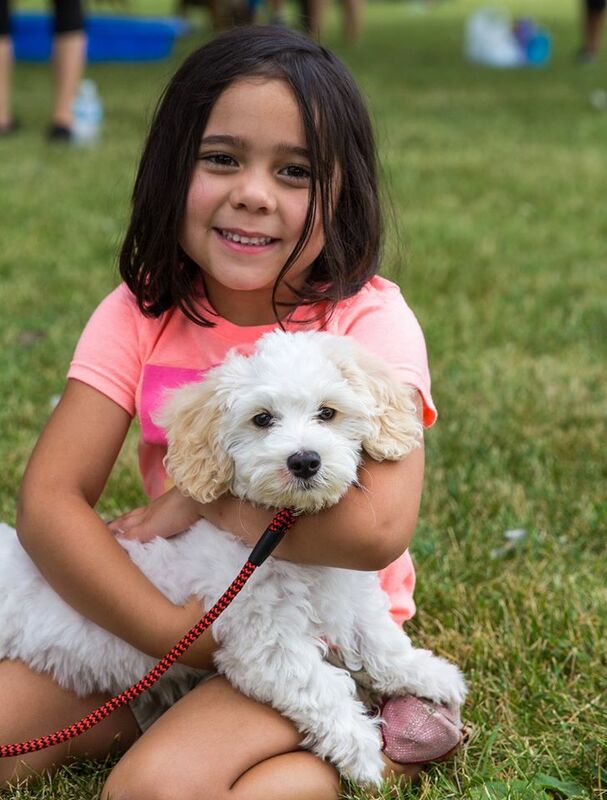 How would this little girl especially dragging a leash survive out there? Forest preserve is 99% forest. I figured she was either going to be eaten by a Coyote or her leash would get caught on a tree or a stump somewhere we would never find her and she would starve to death. I went out looking for her at 7:00am the next morning hoping to see her. I did not and I really still wasn’t in the right mode because I honestly thought she was dead. Then later that afternoon I received a message from the family that she had been seen, that morning, and was still dragging her leash. I was thrilled and upset all at the same time. Here I was not doing what I would have normally been doing because I didn’t see how this little five pound little girl had survived but she did. But she was alive and she was depending on us to save her. I jumped into the mode I should have already been in. I went out with a friend and our two dogs just to walk them out there. I brought food to set up a feeding station along with our trail camera. I had the family meet me out there to leave an article of clothing near our feeding station and to just go out and hang out where she had last been seen. It was dusk now and the Park Rangers had given us permission to stay out there past closing time when it was quiet and dark. I felt we were doing what we needed to but about 12 hours too late because I didn’t expect this dog to still be alive. I was still kicking myself because if she did not make it I would feel responsible. We didn’t have a sighting but I felt more hopeful even though I was still very concerned about her getting this leash caught on something. I drove out the next morning before I was on duty (dogs are known to be seen at dawn and dusk) and saw a guy at the maintenance facility which is where she had been seen last. I asked about if he had seen any dogs. He asked me, do mean the Chihuahua? I answered yes and how did he know. He said the family had just picked her up. Tears came to my eyes and I couldn’t believe it. She had not only survived another night avoiding coyotes and getting her leash caught on something, she had made it home to her family. The tears, of course fell. I asked the guy how they found her. Well next to the maintenance facility is a community garden and next to that garden, in plain sight are two sinks with legs. So this little girl has gone two days without getting her leash caught on a tree or stump in the forest where we would have most likely never found her and she would have starved or been coyote bait. Yet now she gets her leash caught on a leg to a sink right in plain sight where she was easily seen and couldn’t get away. Her dad had already come by earlier that morning, found her and brought her home. This little one defied all odds and did it all on her own. If she had been bigger and not dragging her leash I would have been in a different mindset but instead I underestimated their amazing abilities and instincts. Yes, there was obviously some luck involved but with lost dogs you never know and I learned, you should never ever get up on them. They might just surprise you. And this story could have been very wrong but this little girl showed me that a 5 Chihuahua who misses her family has the will and ability to survive. Thank you, Dana, for sharing your story. 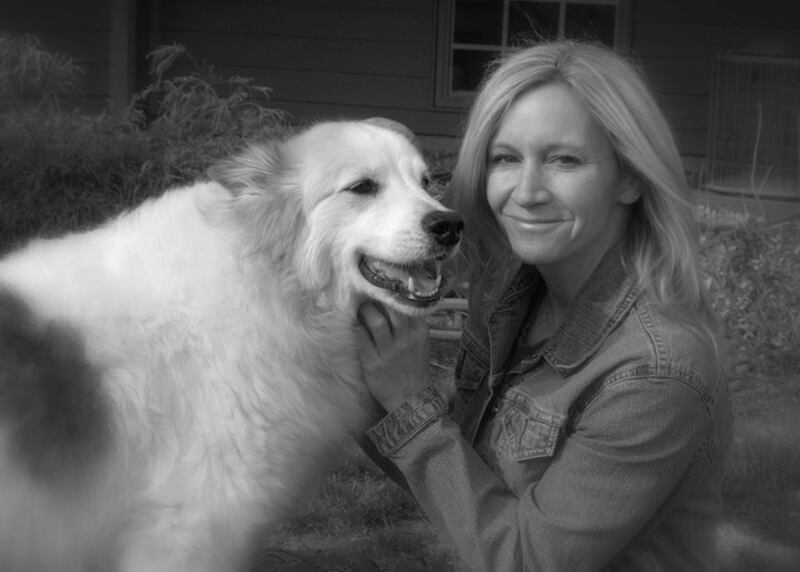 Dana is the animal control officer for North Chicago. This entry was posted in Animal Control/Stray holding facilities, Reunions on June 3, 2017 by Susan. 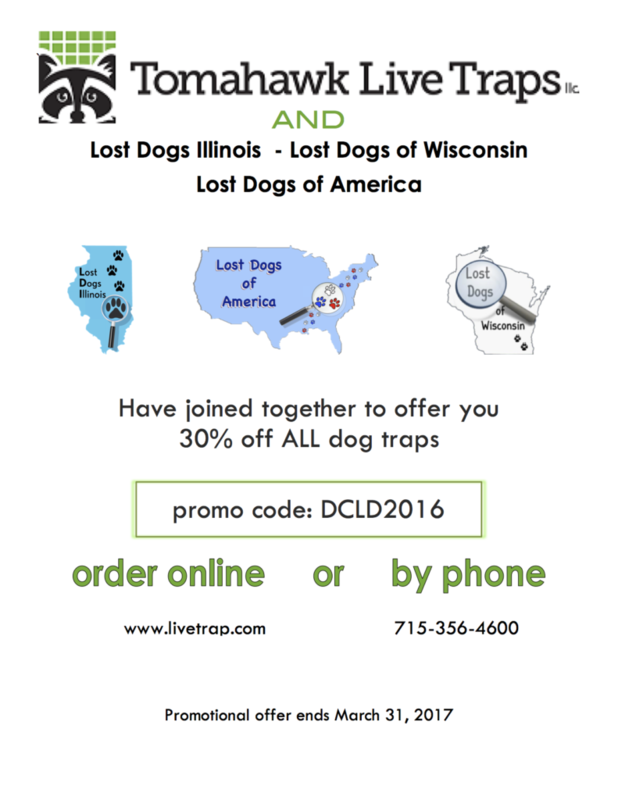 This entry was posted in Animal Control/Stray holding facilities, Rescues and Shelters, Trapping and tagged dog traps, Live human traps, Tomahawk Traps on October 25, 2016 by Susan. 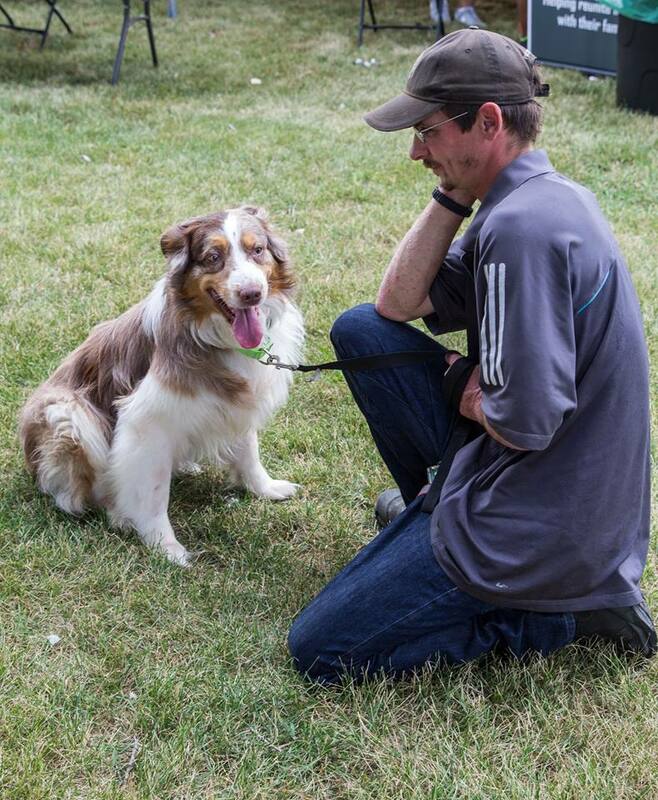 Paving The Way To Help Good Samaritans Find A Lost Dog’s Owner. 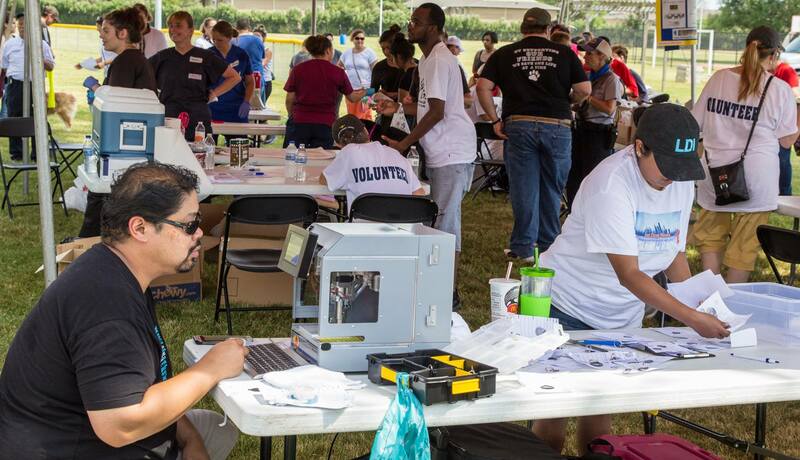 At the Waukegan Coalition for Spay and Neuter Vaccine Clinic, approximately 125 dogs received a personally engraved IG tag donated by Lost Dogs Illinois. 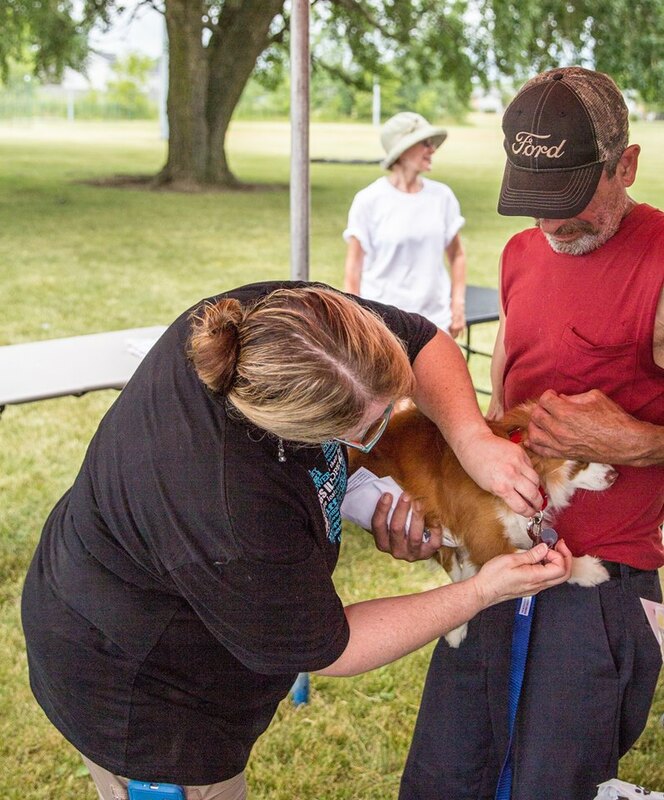 As each dog left the clinic, their tag was attached to their new collar. Pumpkin modeling her new ID tag. 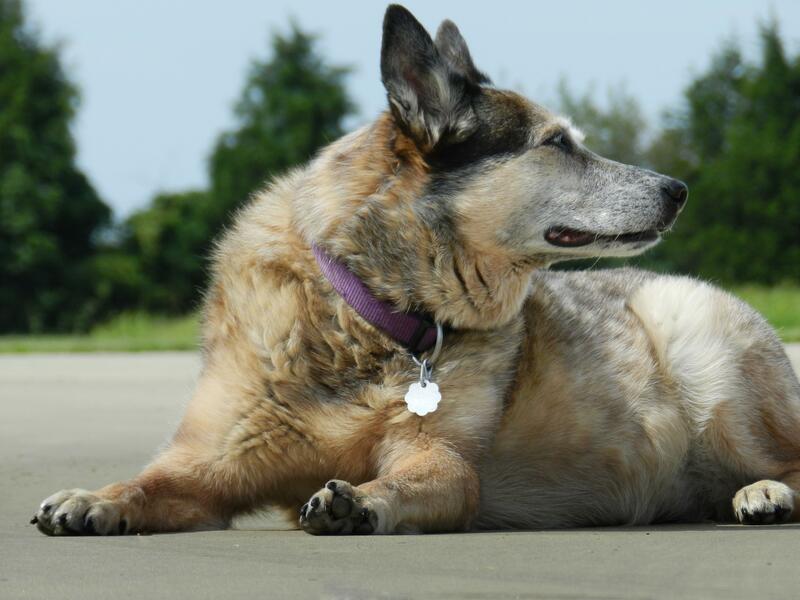 By providing personalized tags, and placing them on each adopted or reclaimed animal, shelters can immediately improve the likelihood that those animals, if lost, will be reunited with their owners. 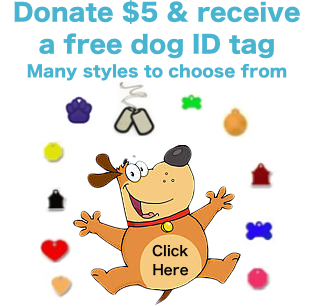 ID tags personalized with the owners’ contact information make it possible for the general public who find tagged strays to return the animals to their owners without involving a shelter or animal control agency. Getting his ID attached to the dog’s collar. As the event rolled on, LDI came to the rescue by donating 50 martingale collars when all of sudden the small Martingale collars ran out. The rest of the small dogs got to leave with a collar and tag. 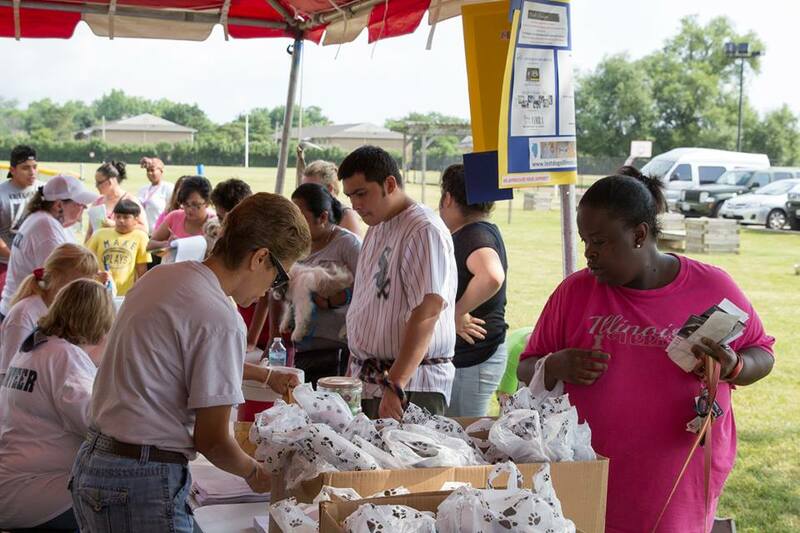 Our community of supporters enables us to provide these services for FREE. Help Us to Help Others to insure their dog has the proper ID attached to a properly fitted collar. 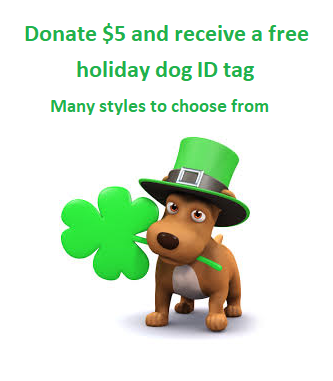 A small donation of $5.00 will purchase an ID tag and a collar. You can donate by clicking here. This entry was posted in Animal Control/Stray holding facilities, Events, ID TAGS and tagged animal control, dogs, ID tags, martingale collars, microchips on August 28, 2016 by Susan. 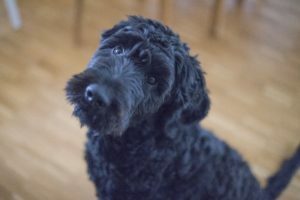 Lizzie’s story as told by her owner…..
My dog was gone for 5 days and authorities still took money from me even though they never had her. Lizzie before she went missing. Last Wednesday-Around 2:40 – I let my 2 dogs outside in our backyard to go to the bathroom before I went to work. The gate was closed and there was nothing to worry about. At 2:43 – I went out to see if they were done and the front gate was slightly open. I freaked out and went to the yard to find our family’s oldest dog there but my other dog was missing. I went inside to get my little brother and he walked around the neighborhood while I drove around. We didn’t see her anywhere. We thought she would be where we usually goes on walks but we couldn’t find her in any yard and nobody had seen her. At 2:53 – I called my mom. She told me to go to work and my brother and dad would find her. I was stressing out and I could barely work without crying my eyes out. At 5:30, -my boss let me go on a 2 1/2 lunch to see if I could find her because my dad and brother weren’t able to yet. I knew that they looked on every block in Broadview. So I decided to head to Broadview Police station and give them my dog’s information. I then went home and called the microchip company to report her missing and to make sure all my contact information is correct because she didn’t have a collar on since she was going to take a bath that day. I then went to go search Maywood since we live 2 blocks away. Around 6:50 – I was driving down 10th avenue in Maywood when I saw a group of men. I asked if they had seen a black dog and they said they saw a dog that was black with brown stripes walking down 10th. I called my dad and started going block to block to see if I could find her. I didn’t have any luck and I got nervous and wondered if she went on the highway. I checked the other side of the highway and saw two Cook County sheriff officers. I told them what happened and if they received a call for a dog. They told me that they don’t receive those calls, but if Maywood finds her they have a scanner so she would be brought home the same day if they scanned her. At 7:14, – I registered her on helpinglostpets.com after my mom gave me the website. At 10:38 – I messaged Lost Dogs Illinois and told them what happened. They said to fill out the sheet, which I did and her post went on their page. I finished work at midnight and I still didn’t have my little girl. Thursday- 11:30 – I started my extreme search to all shelters around the neighborhood. My first call was to Animal Care League in Oak Park. 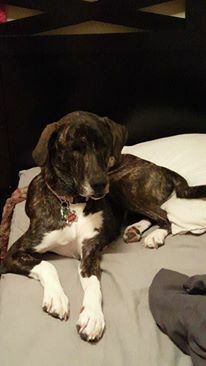 They stated that they receive dogs from River Forest, Oak Park, Forest Park, and North Riverside so if she went in those areas they would have her. I gave the lady my information and Lizzies chip number and hoped she would be found. They told me to call the police stations to see where they brought dogs if they were lost. 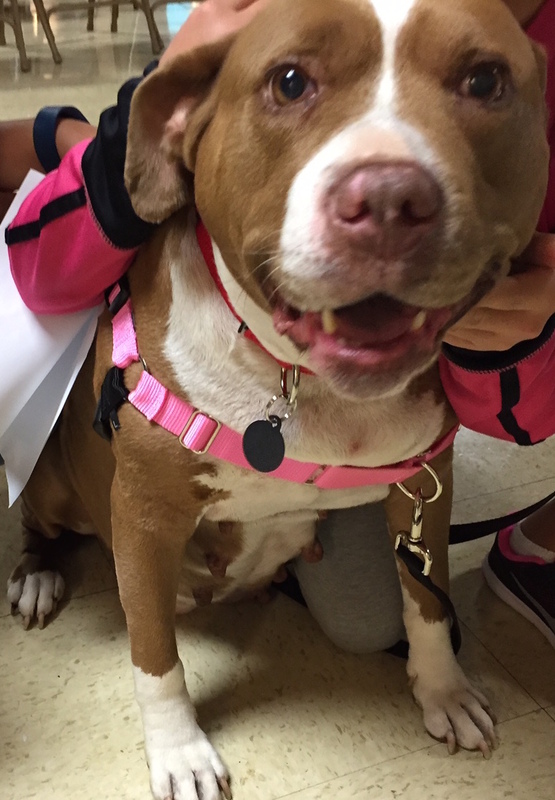 Broadview and Maywood takes their found dogs to Broadview Animal Hospital. At 11:43 -I called Broadview Animal Hospital. They said they never received my dog but if she was found, they have a microchip scanner and I would be called. At 2:51 – I called the Forest Park police station before work. They said they never received a dog but if they did they would take the dog to Animal Care League. Friday-At 8:00 am – I went on a walk through Maywood and these two men told me to call Maywood Animal Control. I tried and couldn’t get a hold of them. At 11:42 – I called The Code Enforcement Department and the lady at the front desk named Karyn said that she would have animal control call me back because he was in court. At 2:00 – everyone was telling me to call them back so I did and no one was answering. I then called 8 times from 2:00 to 4:00 p.m. and never had anyone answer. At 4:00 – I told my dad that we needed to go to the village hall because I didn’t feel right and no one was calling me. We arrived around 4:17 and the lady at the front desk yelled at the animal control man for not calling me after she gave him my number to update me. He showed me a picture of Lizzie and asked if it was my dog and I said YES! And he went to the radio to ask if the dog is at the Broadview Animal Hospital and the man said that there is a pitbull at the hospital not a retriever and the man looked confused and asked again if that was my dog and I said yes and she is not a pitbull. 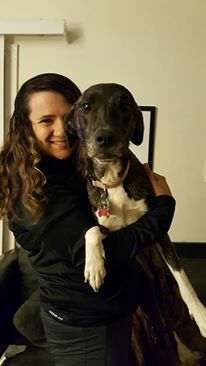 “Trust me I have a pitbull at home.” He then told me I had to fill out release papers and pay a 65 dollar fee for 2 days that she was in the Hospital. He stated that a family found her on 7th avenue on the 1900 block and she let 4 little kids surround her and pet her. I filled the paperwork out, paid the cashier and my dad and I went to the animal hospital. At 4:53 – we arrived and no one was there. We called the number and nobody picked up so we called back to the code enforcement (which close at 5) at 4:54 and no one picked up so I had to wait another day to go pick up Lizzie. Saturday -The day we finally thought we were going to have her. I worked 7-4 that day, but I asked my manager if I could take an early lunch to pick her up at 9:00 when it opens and he allowed me. My parents and I arrived at 9:04. They opened at 9:00 and no one was there. The lights were on so we thought someone had to be there. I called them 8 times, then I called the village hall which was closed. A man finally came in and made me fill out paperwork for 30 minutes and he went to the back to get the dog. He brought out a small black dog and a pitbull. Neither were my dog. 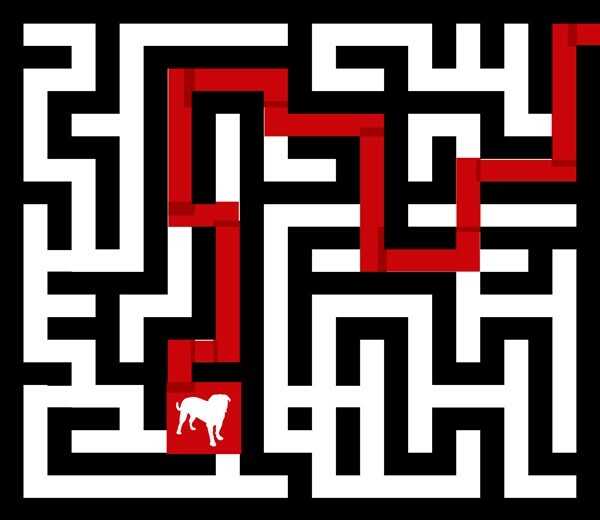 We showed him a picture and he stated that he never seen that dog and he doesn’t know “why the hell they made you pay”. He instructed us to go to the police department to see what happened and we went over there. The dispatch said they have nothing to do with this and we would have to wait for animal control to go back to work on Monday. I had to go back to work, so my parents dropped me off and went back. 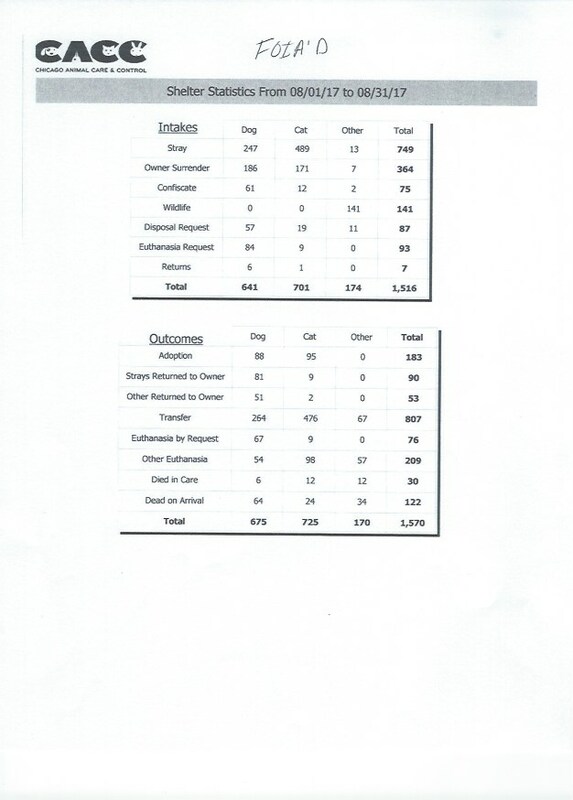 The man showed them the intake records they keep and no dog was received from the location they told me. He told my parents that Maywood has sent multiple families there searching for dogs that has never been there but this is the only time that he has ever seen someone pay for a dog that they didn’t have. They went to Animal Care League and looked at the dogs and didn’t see her. 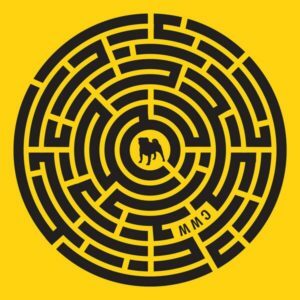 At 2:57 – I called North Riverside police and they never caught a dog. At 3:02 – I called Berwyn police and they also had not seen or gotten a call about a dog. The rest of the day we were watching the Facebook pages hoping someone would see her and driving around the neighborhoods to try and get a glimpse of her. We had a close family friend print out flyers that someone made for us and we posted them on the poles of the street she was found and put a flyer of each of the houses mailbox or door hoping someone would call to tell us what happened. The man at the Broadview Animal Hospital called the cops, which said that an Officer named Guzman answered the call for Lizzie. Someone on Facebook found his number. We called and left a message. Many people emailed other officials including the mayor of Maywood. No one received a message back. My mom went to the police station to talk to a Sgt. Fairley and he said that it is not his problem. A few people told us to look at the Bellwood shed to see if she was there and we decided to go over there. The only dog they had was a pitbull who was very excited to see us. The rest of the day I planned out what I was going to say because I wanted to be as calm as I could be to receive my dog without any problems. Monday at 8:30 – my dad and I went to the village hall. Everyone looked at us confused as to why we were there. I looked an officer in the face and said “my dog was not at the animal hospital.” He went to the back and asked what happened. He came over to me and stated that she was not taken to the animal hospital. The front desk lady said ‘Oh yea! Guzman, you couldn’t take the dog right? Because you didn’t have the truck” In which he replied that he was instructed to leave the dog. The officers went to the house where they left her at with my dad and my dad showed the family the flyer that was on their door and they were saying “Oh yea that’s the dog we found.” They gave her away to someone in Melrose Park because they have 2 small dogs. I went again at 11:00 to see what was going on with my refund and they said it would come on Friday. I asked if I could go with to get my dog because I didn’t trust them and they said they don’t allow people to meet because something could go wrong. (This doesn’t make sense because they asked if we wanted to go with to the family that had her and gave us their address). A man pulled me in his office and apologized and stated that someone should have picked up Lizzie and dropped her off at the animal hospital. He said he had a meeting with everyone to see what happened but didn’t give me any details. 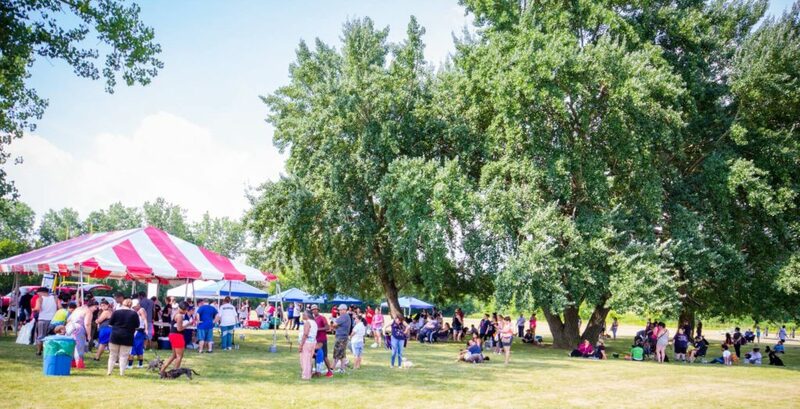 At 5:00 – I received a call from a teenager stating that we needed to meet earlier because they have other things to do then watch over a dog and to pay up because they took care of the dog. Right after, I called the Maywood police and they stated that it is not their problem because it now involves Melrose Park police. I told them that it actually does involve them because it was their code enforcement that screwed up in the first place and they were the ones picking her up. He said that he can’t help and there’s nothing he can do. I received a call from the code enforcement at 5:30 and they said they had the dog outside. I went out and Lizzie was finally home. At 9:14, I received a call from the man that pulled me in his office and he wanted to make sure his employees dropped my dog off. Lizzie is now back at home and so happy. We appreciate everyone that posted about her and helped us along the way because it kept me sane. What Maywood did not go unnoticed and I hope that this doesn’t happen to another family. Thank you so much and hug your fur babies a little tighter tonight because you never know what can happen. 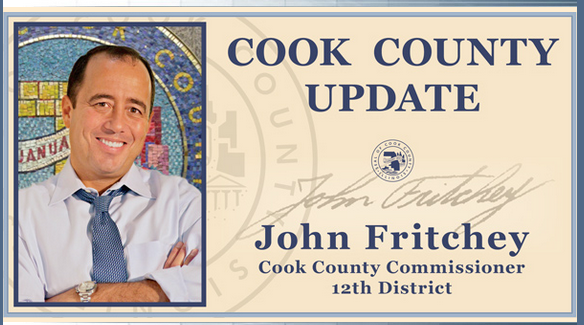 Many long time fans and supporters have read our numerous blogs about how dysfunctional the system is in Cook County. 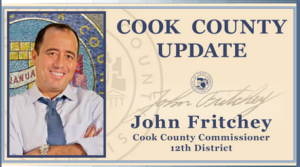 Where Oh Where Could My Lost Dog Be Held In Cook County. Knowledge is POWER! YOUR Taxes and Fees pay the government officials and employees. What the government seems to forget that these are loved family members and they should be doing everything possible to reunite “found” dogs with their owners. 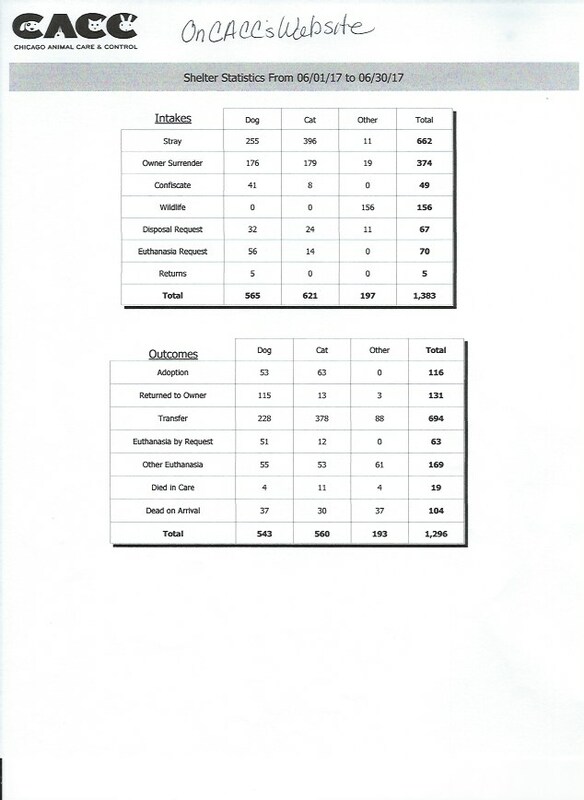 This entry was posted in Animal Control/Stray holding facilities, lost dogs and tagged animal control, Cook County Animal and Rabies Control, Cook County Commissioners, Cook County Inspector General Report, dogs, lost dogs, Lost Dogs Illinois, Stray holding facilties on August 23, 2016 by Susan. 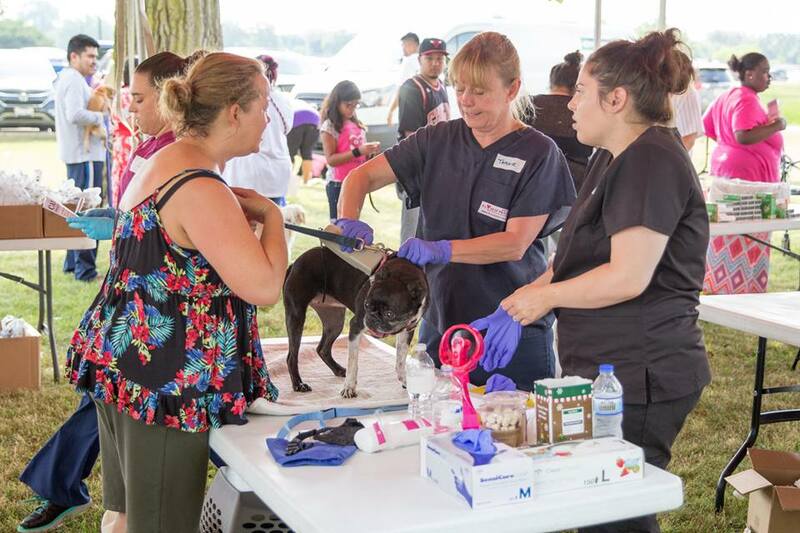 Last Saturday in sizzling heat of 90 degrees-plus, approximately 100 dogs and a couple of cats received free vaccinations, microchips with free lifetime registration, flea and tick products, Martingale collars, leashes and an engraved ID tag that was promptly attached to each pet’s collar. 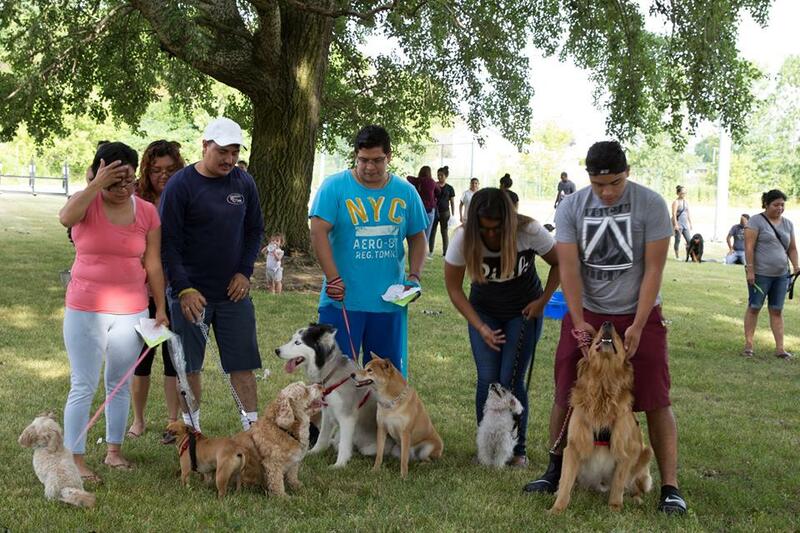 Thirty-five volunteers from other organizations and Lost Dogs Illinois partnered together to work with North Chicago Animal Control. Scanning to make sure the microchip was inserted. Chipped and tagged ready to go! 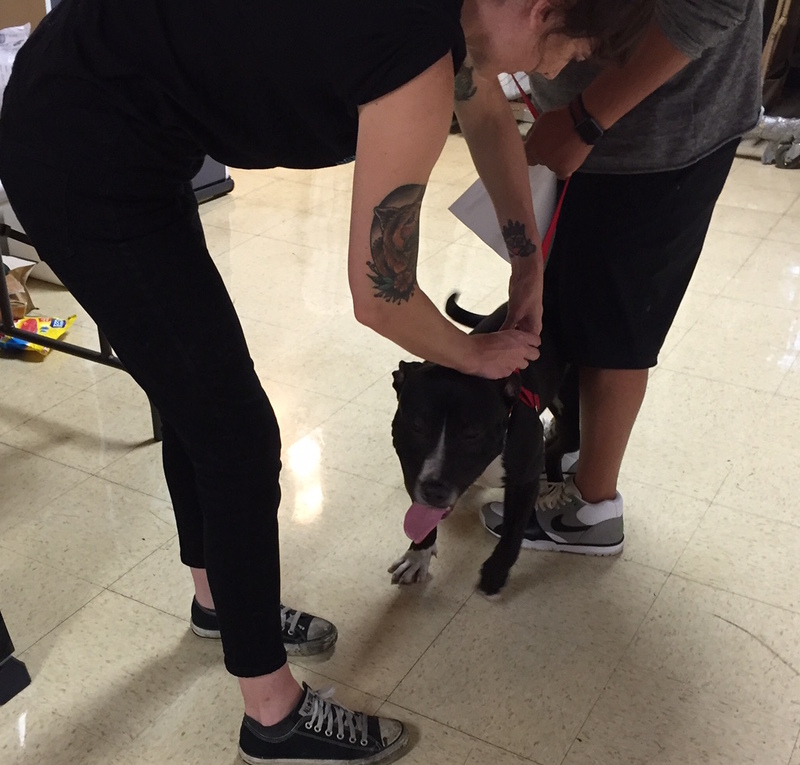 This entry was posted in Animal Control/Stray holding facilities, Events, ID TAGS, Microchips, Our Organization and tagged animal control, ID tags, microchip, microchipping scanning, microchips, North Chicago Animal Control, preserving human/animal bond on July 27, 2016 by Susan.